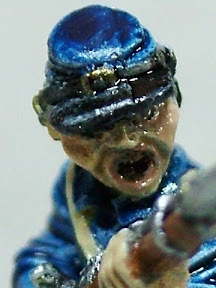 A few pics of the finished Infantryman of Lally de Tollendal Wild Geese Regiment, Irishmen in French service. It is thought that by the SYW it is more likely to be Frenchmen in an Irish regiment in French service, but I'll let others with more time to argue that one out. These photos have been taken as part of my final check (poor eyesight) before I finalise the colours and uniform details. Basically to make sure I'm happy. Two of the sources used in the research, the lower is from the excellent online SYW resource Kronoskaf and the upper the equally good Mouliard Les regiments sous LouisXV online resource for the Moulliard plates of the French Army of, yes you have guessed it, Louis the 15th. Lovely, mate. I especially like the way you've painted the white, it's very effective. I'm delighted. You've done a wonderful job. As concerns sources, my own experience is: do not trust anyone - not even yourself. I've had to redo some of my AWI French regiments in the course of time. At least Minden figures are to be trusted, being based on intensive research. Mouillard is not a bad source, to my experience. I would therefore repaint the hats (white lining). Have you had a look at NEC PLURIBUS IMPAR webpage? Sorry, I must correct myself: yellow hat border is right (Lienhart/Humbert, vol. III, pl. 22). great looking job there, I have a large 28mm SYW project on the go ATM in fact your posy may have just kick started it again as it had stalled a little. Im pretty happy with how he cam out. This sample has more or less fixed the template for his comrades, the few I have, which are queuing up for their kit. James a wargamer isn't a wargamer with out a SYW unit under construction or in the skeleton closet! 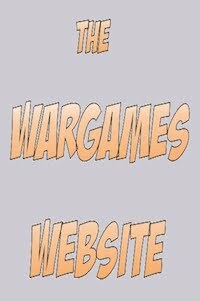 That's proper wargaming after all. Very nice work, Dave. 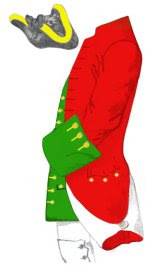 I've always liked the distinctive redcoat uniforms of the Irish regiments.Your paintwork brings this to life beautifully. 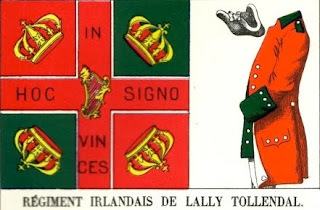 And the Irish's flags have got to be some of the nicest designs around. It doesn't make up for your out gunning me on the painting front though. I love the Irish flags too, get them in amongst the more out there french and the swiss standards and the old french army puts on a bit of a colourful show. 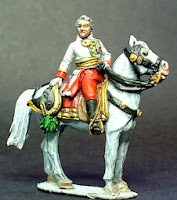 I've been thinking about ordering some Croats from Frank next, even though the Austrians are some way off my radar the examples from DAF and others look great.